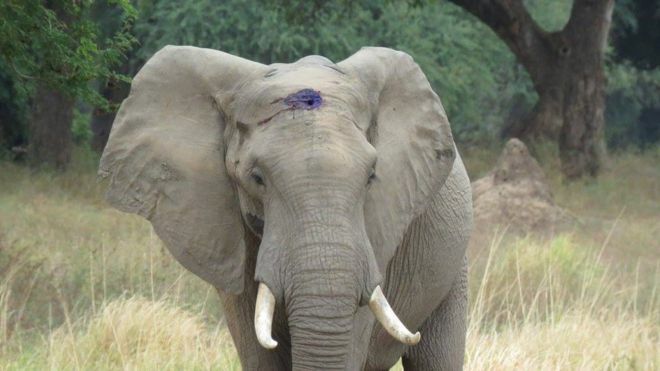 An elephant in Zimbabwe has received medical treatment from a conservation group after being shot in the head by suspected poachers. 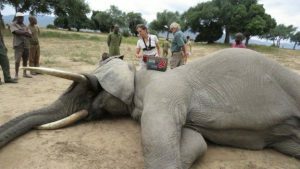 The elephant was found by veterinarians from Aware Trust Zimbabwe in Mana Pools National Park. He is believed to have been living with the bullet in his head for between three and six weeks. Mana Pools has long been a target of poachers who kill elephants for their ivory. 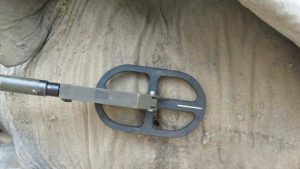 The team sedated him, took an X-ray and cleaned the wound but judged it safer to leave the bullet in place, Dr Lisa Marabini told the BBC. She said the elephant is believed to be around 25 years old and might require further treatment. “We think he was shot outside of the park and came into the park for refuge,” she said. Hunting areas exist near the park. She said the elephant, nicknamed Pretty Boy, approached the veterinarians and showed no aggression. If the shot had hit a few centimetres lower down it would have gone into his brain, she explained. The elephant also had a shoulder injury. Earlier this year, an Italian father and son were killed by wildlife rangers in Mana Pool during an anti-poaching patrol in an apparent case of mistaken identity.